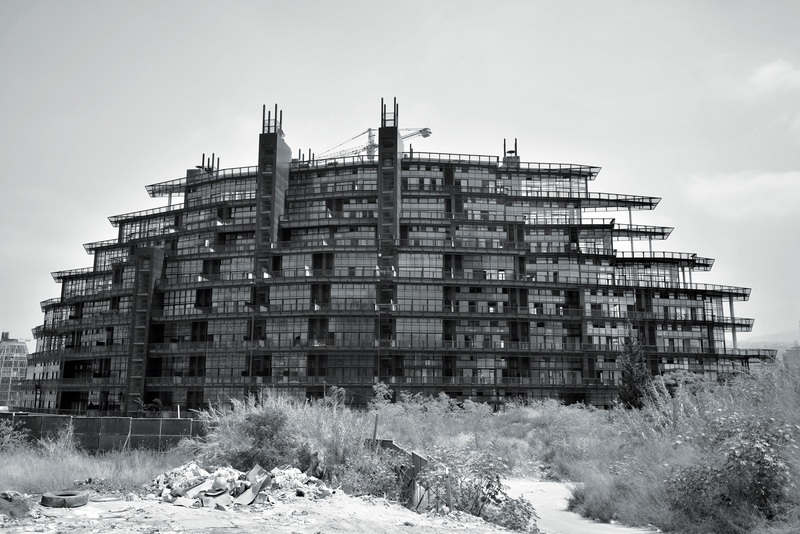 In 2008 Mark Doumet, CEO of Loft Construction, was looking for land to develop a third building in Beirut. He had already built two in Achrafieh but the price of real estate was rising fast. “I was looking at Google Earth and between Achrafieh and the Beirut River you had a whole area, a triangle that was surrounded by major roads, and it was completely empty. It was so obvious that this was the next step,” he says. But Doumet understood that selling this obscure area close to Jisr el-Wati to customers would be difficult without a brilliant concept. Inspired by the design-driven strategies of Steve Jobs, Doumet works by putting form before function, asking engineers to find solutions for what architects design, not the other way around. “We focus on beautiful design – that attracts customers – and cost is not our primary concern because if we build something really nice, even if the cost is higher, you’ll be able to sell,” he explains. His – admittedly gimmicky – idea was to install a car elevator in the new building so residents could park their cars on their own floors. Doumet asked star architect Bernard Khoury to work on the project and was initially met with rejection. Already skeptical about the car-elevator idea, Khoury and Doumet drove to see the land but Khoury refused to get out of the car when he saw the area, completely shutting it down. He called Doumet 48 hours later and admitted, after studying it further, that it was not that bad after all and agreed to work with him. Indeed, the area is not just an empty-ish triangle; it’s full of potential. Though technically considered part of Achrafieh, most people think the district stops at the bottom of the Sioufi hill. While many of the region’s buildings are industrial spaces and factories, it’s also an arts hub, housing Beirut Art Center, STATION, Ashkal Alwan and the offices of prominent architect Nabil Gholam. The main point of interest is the abandoned train station that used to connect Nabatieh and Tripoli, even though it hasn’t been used in years and will not likely be revived anytime soon. In a sense, it’s a historical neighborhood that is also very accessible, with major highways and roads leading to most parts of the city crossing through. Doumet laments that when his company bought the land for what is now the Artist Lofts building, he wanted to buy more land surrounding it too: “Since we would be the first building, we could sell the others at higher prices. But the shareholders only wanted to invest in one building initially. I told them later it would be too late, that prices would skyrocket, and this is exactly what happened.” Doumet says the land was worth $2000 per square meter when he bought it, and grew to $4,500 only a year later. “People realized this is the next area of Beirut,” he says, acknowledging it was not just Artist Lofts that sparked the increase, but insisting that the project contributed to it. Other developers swooped in on the area like Doumet predicted. Upcoming projects in the area include Upark by Har Properties, Factory 4376 by Estates, both designed by Charles Hadife Architects, and CGI’s Urban Dreams project, currently in the excavation stage right next door to Artist Lofts. Loft Construction is also developing two new buildings in the area. 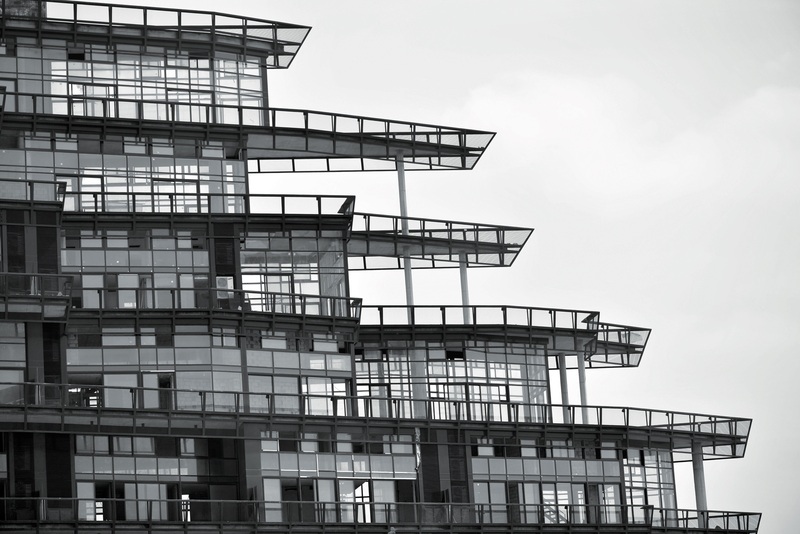 Factory Lofts – which Doumet says looks like a black ship – is another collaboration with Bernard Khoury, delivering this year with 76 percent of apartments already sold. 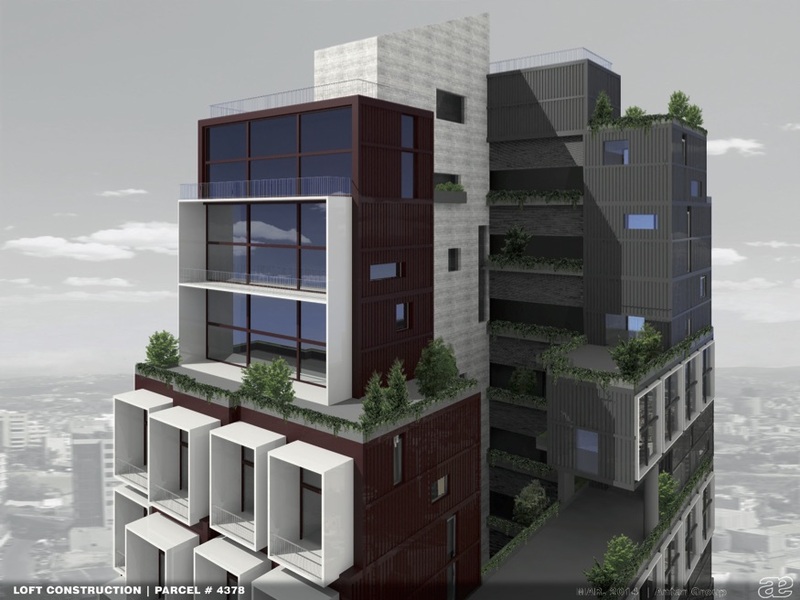 The upcoming Warehouse and Lofts, designed by architect Talal Antar, is a mix of office, residential and commercial spaces that has a container concept. Though not made out of real containers (which would have been too costly), the building will be fashioned to look as such. Doumet says the developers in the area wanted the space to be a community, not just buildings. They collectively asked the municipality for permission to standardize street lighting, sidewalks and are looking into building a fence around the neighborhood, forming a gated community of sorts. They also registered the area under the name Soho Beirut and are currently waiting for the approval to officially use the Soho name. While the largely industrial area isn’t quite like its New York and London counterparts (and many in Beirut agree the real ‘Soho’ is in fact Mar Mikhael), Soho Beirut is definitely an artistic area with a lot of “boho” potential. The people who would want to live in such buildings and such a neighborhood, are younger, edgier and wealthier than many Lebanese. “These are not copy-paste buildings like most in Beirut,” says Doumet, adding, “it’s like Soho New York, an old industrial area turned into some kind of yuppie living space.” He says the lofts are relatively affordable, costing $200,000 for 60 square meters apartment. However other developments in the area are a complete departure from the design-oriented philosophy of Loft Construction and similar developers. Al Mawarid Real Estate’s Achrafieh 4748 is a complex of three giant towers that target a much more commercial audience. According to Doumet, “It’s difficult to convince a developer to go toward what you think is right. Everyone has their design views and cost constraints, and it’s not up to me to decide. This is something the municipality should control.” While in other countries governments have strict aesthetic regulations that buildings must conform to, Lebanon’s rules are often outdated, and as long as a developer gets a special permit to build high towers, it’s perfectly legal. Soho Beirut definitely has the potential to be an interesting, historic neighborhood but much depends on what is done with the rest of the land in the near future. If the area is going to keep its edge, it’s essential to keep the fabric and identity of the area by maintaining the coexistence of the industrial buildings and reviving (or at least not destroying) the train station. With the wrong developments, Soho Beirut could turn into another senseless neighborhood of shoeboxes for living, but with more well-thought-out and well-executed unique designs, it can be the truly trendy neighborhood its developers are trying to make it into.